First and only Sondheim of the season. One should be under no illusions about Sondheim. His work is genius, but it’s not easy to get right. Merrily We Roll Along follows the life of composer Franklin Shepard, starting at the end of the story as his success crumbles away around him when he realises that on the way to fame and wealth, he has lost the people he cares about the most. The story then travels back in time, reversing the decisions Franklin makes, and ending at the start, where he and his closest friends have nothing but optimism. As is always the case, Sondheim’s musical score is exquisite, with multi-layered harmonies and a huge range of songs incorporating both lyrical numbers, and more dialogue-based elements. 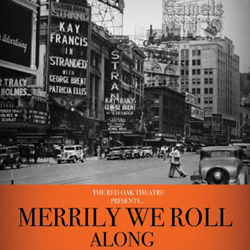 Tying the whole score together, the title song “Merrily We Roll Along” is used to designate the movement back in time. The story as a whole is typical of the “American dream” genre of American art. In this particular case, some of the American dream rhetoric is challenged (that about wealth and fame being the highest form of success) while others (doing what your heart desires no matter what) are underscored as morally good. Certainly, if this is Sondheim commenting on his experience of success, he implies that his fame as a composer is not as important to him as the musical works he has produced. However, I doubt Mr Sondheim is strapped for cash yet he censures Franklin for making decisions which bring financial gain at the cost of his art. Unfortunately, I feel Stephen Sondheim is in the same category as Jason Robert Brown – best not attempted by amateurs. Although this cast did well to perform the music, I felt there was significant depth missing in their acting performances. I didn’t really believe the depth of the friendship between Franklin (Henry Adams) and Charley (Andrew Horton) – I mostly wondered what they could possibly have seen in each other. Franklin was too business minded, and Charley too geeky, and so they seemed to fundamentally have nothing in common. Equally, though Mary Flynn (Rosie Archer) is supposed to be in love with Franklin, she mostly came off as lonely and desperate, rather than devoted. I felt the direction left this whole show a cast of caricatures, which trivialised the deep and powerful emotions running through the musical score. There were also significant problems with audibility at times as not all of the cast had mics. Although the central cast were afforded amplification, there was no such grace given to the supporting chorus or peripheral characters and as a consequence there were a lot of lines which were not clear over the volume of the live band. It would have been a better decision to either mic everyone, or no one, rather than having a mixture. The band, I must say, were brilliant, and I really enjoyed being able to see the musicians on set. I have seen shows of this difficulty suffer from lack of a conductor, but that was not the case here. This is not one of Sondheim’s most innovative or exciting musicals, although it is not without merits. However, I was underwhelmed by the performances of this cast. A less difficult show might have seen them produce very good theatre. As it is, this is little more than mediocre. The band, should, however, be congratulated for being the highlight of the show for me – I actually think I spent as much time watching the musicians as the actors! This entry was posted in Musicals, Reviews and tagged 3 stars, fringe 2013, musicals, reviews on 19th August 2013 by .